REGISTRATION for the Star Party IS NOW OPEN! There is no rush to register, but feel free to anytime. Just hit MENU then Register/Order and follow the instructions. Early registration is in effect until August 4, but you can register right up to the date of the star party, or even at the star party. We are happy to say that the only increase in costs from 2018 to 2019 is a $2 increase in the base registration fee! FOR THE COMPLETE STAR PARTY MENU, click the red MENU button at the upper left of this page. All Meadows campsites are booked through SSSP at the email addresses below or by telephone. You can book your campsite before you register. SSSP will start accepting Campground bookings on April 14 at 9:00 a.m. CST. Email your request to sssp.sk@sasktel.net, or rickhuziak@shaw.ca or call 306-665-3392. Please request your preferred site number and one or two alternate sites. SSSP will book sites for you in the order that they are requested and you will receive a confirmation by email. To be fair to everyone, campsites are issued on a first-come first serve basis and we WILL NOT take bookings for a specific campsite before April 14. Once you receive an assignment from us, you are booked for Star Party nights, but you can then attempt to book extra nights for your site (before or after star party dates) through Reserve-a-Site starting April 16 at 7:00 a.m. CST. Note that 60% of the most-preferred SSSP campsites booking in the first 48 hours of registration opening. But we do have 108 powered sites and room enough for over 100 overflow (non-powered) campers and tenters, so we can always accommodate you right up to the date of the Star Party. See a full description of camping and campsites and the Camp Map at "Menu | Resort/Camping | Camping in the Meadows". Starting this year, you will need to present your paid camping receipt in order to pick up your registration package. Our room block at the Resort runs from Wednesday August 28 through Saturday August 31 (up to four bookable nights). There are a mix of hotel rooms, townhouses (2 and 3 bedroom) and cabins (2 and 3 bedrooms). BOOK YOUR RESORT ACCOMODATION as soon as you can. We will be releasing rooms back to the Resort sooner this year than in previous years. Contact the Resort at 306-662-4477. Additional information about the Resort is available at their website. The SSSP 2018 Group photo (and past group photos) can be found in "Galleries | SSSP Group Photos" under the Menu. Contact us at sssp.sk@sasktel.net or call Rick Huziak at 306-665-3392 or Les Dickson at 306-249-1091. Check back often for new developments and announcements. Come early and stay late if you choose. Most events take place in the Resort's Wapiti Room (WR), the Meadows Campground Observing Field (MC), the Park Amphitheatre (PA) or the Dark-Sky Campground (DC). Every day ends with viewing in the MC. This schedule is subject to change without notice. Check the notice board at the Registration Tent for any changes. For each of the categories 1-5 above, a First Prize plaque and a Second Prize certificate will be awarded. Photography Novice Award: Awarded to an entry from someone who has not won before at any star party. A maximum of 2 photos can be entered per person, and a maximum of 2 sketches per person. Images may be in printed or in electronic format. All entries must be identified with labels provided. Photos do not have to be taken at SSSP nor within the same calendar year. Winning photos or sketches from previous SSSPs cannot be entered again. Entries cannot have won anywhere else, but could have been entered elsewhere as a non-winning entry. Sketches must be field sketches either completed at the eyepiece or started at the eyepiece and finished later based on observing notes. All sketches must be hand-drawn. The SSSP will be accepting Electronic Images for the astrophoto contest. Please bring your images on a memory stick and load them onto the SSSP laptop in the Wapiti Room - opening times will be in the SSSP Handout. Images will be displayed in a scrolling Powerpoint program, but judges will have the original images available to view. Printed images may certainly still be entered. All entries must be received by 11 AM on Saturday morning of the Star Party. The Resort catering staff will be serving a single meat entrée buffet. The banquet is served in the Wapiti Room, starting at 6:00 pm Saturday. Costs for the banquet are: Adults 11 yr+, $38; Youth 6-10 yr, $24; Children under 6 yr, free. There are a limited number of places for the banquet. We strongly suggest that you preorder your tickets when you register. A small number of places will be held for at-the-door registrations but only if the room limit has not yet been exceeded. We also ask if you find that you are not able to come to the banquet but have preordered tickets, to contact us immediately by phoning (not texting) 306-280-1899. We will refund your banquet ticket costs and will allocate your tickets to people on our waiting list. If you do not contact us beforehand and you do not show up, your banquet ticket costs will NOT be refunded. See "Refund Policy" [insert link] for more information. If you have specific dietary requirements, please contact the star party organizers by e-mail or phone. The Welcome Barbeque starts at 5 pm on Thursday and will be held by the Amphitheatre. Tickets are $7. The menu is all-you-can-eat beef hotdogs, salad, goodies and drinks. Vegetarian hotdogs are also available. This is a great time to socialise with Star Party attendees. In case of inclement weather, the event will move to the log cabin Community Centre by the lake. The public talk will start at 7 pm at the same venue. Other guests and additional information will be posted as information becomes available. SSSP intends to run a Kid’s Program again this year. Details will follow at a later date. Please check back. REGISTRATION WILL OPEN AROUND APRIL 12, 2019. Our room block at the Resort runs from Wednesday August 28 through Saturday August 31 nights. There is a mix of hotel rooms, townhouses (2 and 3 bedroom) and cabins (2 and 3 bedrooms). When contacting the Resort, ask first for a room in the Star Party room block. If none are available, ask for any room that might be available. If there are no units available, contact our Registrar Rick Huziak at 306-665-3392 or sssp.sk@sasktel.net. We are maintaining a waiting list for people who wish to find accommodations in the Resort. Do NOT ask the Resort to place you on their waiting list: they do not maintain a waiting list of their own. Note that we will have to release a portion of the unbooked rooms in our room block back to the Resort about a few months before the star party. So, if you want to stay in the Resort, book your accommodations as soon as possible. SSSP observing and clinics are held in the Meadows Campground. For the dates of August 28 through September 2, all SSSP campsites are booked directly though Rick Huziak, separate from the Registration process. Rick will provide instructions on how to request a campsite numbers as request from e-mails. To be fair to everyone, campsites are issued on a first-come first serve basis STARTING ON THE DATE WE OPEN CAMPING RESERVATIONS, so we WILL NOT be taking bookings for a specific campsite before we officially open camping, and will ignore all requests received beforehand. Once you receive an assignment from us you are booked for Star Party nights, but you can then attempt to book extra nights for your site through Reserve-a-Site starting April 16. Note that 60% of the most-preferred SSSP campsites booking in the first 48 hours of registration opening. But we do have 108 powered sites and room enough for over 100 overflow (non-powered) campers/tenters, so we can always accommodate you right up to the date of the Star Party. The provincial Reserve-a-Site website shows these campsites are blocked out because they have been exclusively reserved for SSSP attendees – they are indeed available. Reserve-a-Site opens April 16th. See here for camping fee structure. The Meadows has pull-through and back-in campsites for RVs or tents. Every campsite has power hook-ups, a fire-pit and a picnic table, and some have water hook-ups. There is also ample over-flow camping. If you decide to come earlier than the official reserved days of SSSP (August 28 – September 2) you will be sharing camping with non-SSSP campers, but they will all have to leave by the time SSSP begins. The campground lights will be extinguished from August 28 until the morning of September 3. Camping costs Electric: $30/day, Overflow: $20/day. Camping is booked through the SSSP Registrar, but fees are paid to the Campground Office at the gate entrance on arrival at the park. You will need to have a paid campground permit for your campsite to pick up your registration package. If you need dark skies before that, you are welcome to observe from the Dark-sky Campground at the Observatory. The Observatory has a six guest pads and power plugs on the south side of the building. If you want to camp in the Dark-sky Campground before the star party begins, book directly with the Park Campground Office. WHITE sites - available; PINK sites - booked; BLACK sites - not available for SSSP. Bookings for the Meadows during the days of the SSSP will be handled by the SSSP REGISTRAR, Rick Huziak. If you have any complaints or disputes about camping, please talk to the Registrar, and not the Campground Office. Use the Camping Map in the tab above and pick your SSSP campsite. If the spot is not pink or black, it might be available. If the map starts to look full, don’t panic - we will find a space for you! An updated map will be posted weekly. Email Rick Huziak at sssp.sk@sasktel.net (preferred) or call (306-665-3392) with your campsite choice. He will try to get back to you on the same day and confirm your desired booking. You may put one camper or one tent on the site if you are the owner of the site, plus an additional tent only if they are directly related family members. Site costs are: Electric: $32/night; Non-electric: $20/night; Economy/overflow: $20/night. All site fees are payable to the Park Campground Office once you arrive at SSSP. They will have you on their reservation list. You may take any or all of these five days, paying for only the days you use. If you intend to come earlier than August 28 or stay later than September 2, then you must book those days and pre-pay for your camping through the Sask Parks Reserve-a-Site. SSSP cannot book days outside of SSSP dates. We strongly suggest you book extra days as close to April 16 as you can (when Reserve-a-Site opens), since Meadows is a very popular campground. If you are there earlier than August 28, you may have to return to the campground office on August 28 to pay for your SSSP camping period. All sites not booked by the first day of SSSP will be treated as rush sites, first come, first serve, and will be booked at the Registration Tent. If you cannot attend SSSP, please let Rick know so he can cancel your booking. FRIENDS and FAMILY – If you are bringing friends and family who are not astronomers, please make extra effort to talk to them about red light rules and how to totally back-cut their campers and campsites. Due to the park’s addition of a Seasonal Campground north of the Meadows campground and the Park Overflow area just to the west, we will be having more trouble restricting white light from car headlights or park overflow campers in some of our peripheral campsites. We strongly suggest that campers using Sites M1 – M30, M68, M114 – M117 set their equipment up in the main observing area, and only use your campsites for camping. We will be doing less white light patrolling in those areas. SSSP holds the star party in the Meadows to provide campsite power, water and the service centre, and for this convenience, we do share the area with nearby non-astronomer campers. The main observing area is very dark. Some tenters have mentioned that some campsites are not suitable for tenting since the gravel pad area is too hard to pound pegs into and that there is no adjacent grass. These sites would be: M119 – M125, M61, M75, and some sites in the M129 – M135 range. Please inform the Registrar you are tenting. The SSSP has sites M1 – M76, M115 - M117, M119 - M127 & M134 - M143 booked for SSSP participants. Books these sites through Rick Huziak at sssp.sk@sasktel.ca. ALL CAMPSITES HAVE POWER. Some have water. Campsite capacity details and images can be found on the Campsite capacity details and images can be found on the Reserve-a-Site website. Open field camping. Unprotected from Bald Butte Road, so car headlights will be prevalent during the Friday and Saturday night public star nights now held at the observatory. Cars will run up and down this road from 9pm – 11pm both nights. Great horizons, except for low south. You can also just camp in these sites and set your telescopes up for the weekend in the main grassy area of the Meadows. Camping spots sheltered in the trees, but unprotected from Bald Butte Road, so car headlights will be prevalent during the Friday and Saturday night public star nights now held at the observatory. Cars will run up and down this road from 9pm – 11pm both nights. You can also just camp in these sites and set you telescopes up for the weekend in the main grassy area of the Meadows. Great north, east and west horizons. Camping spots sheltered in the trees. No light issues – face the Meadows grassy area. Great south, east and west horizons. SSSP registration tent and Star-Lite Café. Open field camping in main grassy area of Meadows. No shade, but excellent horizons in all directions. Camping spots sheltered in the trees. No light issues – face the Meadows grassy area. Great south and east horizons. Camping spots sheltered in the trees, but down a fair slope. Very shaded, but is low. Large campers might have trouble getting down and up. No light issues – face the Meadows grassy area. Great south and east horizons. M66, M67, M68 Camping spots sheltered in the trees. Horizons are not all available from here, so parking telescopes elsewhere is advised. Camping spots sheltered in the trees. No light issues – face the Meadows grassy area. Great north and east horizons, and south horizon looking down the road. Camping spots sheltered in the trees. May be some light issues as the next sites to the south are public sites, though SSSP will talk to adjacent campers about the need for sheltering any lights. Great north and east horizons, and south horizon looking down the road. These spots are completely in the trees. If you want to be away from the crowd, these are good spots, but there are no clear horizons; you would have to set your telescope up in the main observing field for the weekend. It is a 1-minute walk to the observing field. Camping spots sheltered in the trees. There are no horizons available from here, so observing is recommended by parking scopes to the north through the trees near the playground. Note that the washroom near Site M118 no longer has a red night light. Open field camping in main grassy area of Meadows. No shade, but excellent horizons in all directions except low south. Camping spots sheltered in the trees. No light issues, but may be near public campers – face the Meadows grassy area. Great north and east horizons, and west horizons. If you are tenting and do not want a powered site, can you overflow camp in the Meadows. You can do this only during the five official SSSP days. We have designated an overflow tenting area just northwest of the Service Centre, but you can tent anywhere there is room. If we exceed the approximately 108 sites in the Meadows, we would like those who have paid for a powered site to offer a corner of their site to other tenters, trailers and telescopes - there is ample room. Note that we have special permission from the Park to double up on campsites if we fill all campsites. If you are tenting outside of the overflow area, please ask the nearest site owner if it is okay to share their site. Overflow campers must pay $20/night at the Campground Office, even if sharing a site with someone else. Overflow campers will NOT get a picnic table, so bring your own table. If you need power, then make a deal with the site owner to plug into their pole (so bring a 50-foot extension cord). Do not camp on any roads. Outside of SSSP dates, you must take an official campsite. If you do not want to camp in Meadows, the Dark-sky Campground is available. But SSSP events and activities are held in the Meadows. The Dark-sky sites are more rustic, have a fire-pit and a picnic table, but no power. Rates for these sites are $18/night. This is a great campground to use for astronomy before or after the SSSP or at other times of the year. There are power plugs and pad for telescopes and battery changing on the south wall of the nearby Cypress Observatory, if desired. The Dark-sky Campground is a 7-minute walk from the Meadows Camoground. When arriving at SSSP, enter the Meadows through traditional gate at the Meadows Comet Petriew cairn. The Registration Tent will be there, and you can get registered and find your campsite. You will need to show your paid camping permit to pick up your registration package. Those working at the Registration Tent can offer guidance on sites for overflow campers and for those who will just set their scopes up for the night. Do not use the Ball Diamond entrance, which now goes to Meadows-B sites used by the public. The Service Centre has flush toilets and showers and will be red-lit for the duration of the SSSP. Note that the Service Centre will also be used by non-SSSP campers who occupy other sites in the Meadows. The Park and the SSSP will make efforts to educate these users about telescopes and the star party, and will offer red filters for their flashlights, so if you see a white flashlight, please remind them CALMLY to point them downward. Do not yell at them, or SSSP gets yelled at by the Park. If you are not staying in the Meadows and want to set up and leave your telescope or equipment tent, you may do so by using the tent overflow area, or by occupying a corner of a powered site or a grassy area in between. Have a talk with the site owner to assure they are OK with you setting up there. Equipment tents are allowed but must be labelled "Equipment tent" and must not be occupied. There is no charge to put up an equipment tent. You may leave your equipment set up for the duration if you wish. Leave room for the site owner to get in and out of their site. You will NOT get a picnic table so bring your own table. If you need power, then make a deal with the site owner to plug into their pole (so bring a 50-foot extension cord). Do not set up on any roads. The streetlights will be on in the Meadows outside of SSSP dates, so it would likely be best to observe from the Dark-sky Campground or another area in the park. Google map of park with markers (click on map to get GPS cordinates). The SSSP will honour international currency conversion rates before and at the Star Party. BANKING MACHINES: Cypress Hills Park contains Interac banking machines that issue Can$. Banking machines can be found at the Resort, Visitor’s Centre and at a few other locations around the park. The SSSP Committee welcomes astronomy (and related) dealers to set up booths at the SSSP. At this event you have the potential to reach over 350 astronomy enthusiasts just looking to buy something. To participate, you are asked to follow the standard registration procedure - i.e. vendors must register as normal participants at the normal costs for the star party. You may in turn sell and conduct normal business within the Meadows observing field, but due to Park restrictions cannot solicit elsewhere in the park. The SSSP is not responsible for any vendors' business costs (transportation, accommodation, living, etc.) Vendors are responsible for their own arrangements, park entry and must pay standard camping fees (to the Park) and campsite power if needed, if staying in the Meadows. The SSSP is not responsible for any merchandise loss or damage. As registered SSSP star party goers, vendors are welcome to participate in all activities that they have registered for. In a further attempt to foster on-going good will, star party vendors will be entitled to one ad of one page or less in the Saskatoon Skies monthly newsletter, over the coming year. These ads are at no additional cost. Our current newsletter circulation is approximately 80 copies, but these are highly targeted readers & the newsletters are also on-line. All ads are subject to approval by the Saskatoon Centre Executive before inclusion in the newsletter. We will do our best to publish the ad in the month desired. Check back often for new developments. The SSSP is a Red-Light Only Zone from sundown to sun-up. We are not unique: all star parties insist on no white lights and red lights at low intensity to preserve night vision for participants. If you are a new attendee or do not understand these regulations, ask a star party organizer for assistance. If you see lights in the Meadows that are bothering you, please ask an SSSP Organizer to assist in fixing the offending lights. FLASHLIGHTS: White light flashlights are NOT allowed! Use only red filtered flashlights, point them at the ground and keep them as dim as possible. VEHICLES: Please make sure to have your car parked in its final resting position well before darkness sets in. If you do not intend to remain in the Meadows Observing Field all night long, park and set up near to the entrance so you can leave without blinding everybody! The most common offending light issues with vehicles are interior dome lights and uncovered backup lights coming on unexpectedly and blue flashing security lights on the dash. Please cover these. MOVING VEHICLES AT NIGHT: If you have to move after darkness, cars are to use their park-lights only, or be lead with their lights off by someone with a red flashlight. (This is not advised for safety reasons and to be used only in an emergency). Gate security people will have a limited supply of red flags to cover car lights. Cover the following lights: interior, back-up, license plate, trunk and headlights. Gate security people will tape red flags your vehicle lights at the gate as you arrive. RV WINDOWS, DOORS, STRING-LIGHTS AND PORCH LIGHTS: These are all of great concern. Curtains alone are rarely thick enough to stop light from being emitted out of the trailer. It is sometimes necessary to tape black bags or extra coverings over windows. Please cover all windows on RVs as not to accidentally have a family member flash the crowd with white light. REGISTATION TENT, VENDOR TENTS & SERVICE CENTRE: These areas are red-lit as gathering or service places. LASERS: Red and green lasers are permitted. Do not point them horizontally at people or trailers! Do not point them at aircraft or you will be in violation of Transport Canada safety rules and can be arrested, and you will jeopardize the SSSP. Lasers will show on astrophotos if they are held in the same place for many seconds, so please use them sparingly. Lasers will be used extensively during the scheduled starwalks from 10:00pm to 11:00pm on Friday and Saturday nights. A full set of Light Etiquette suggestions will be in the registration brochure in your registration package. The SSSP is held in a provincial park, thus provincial park entry fees apply to your stay. Pay at the park gate as you enter. The SSSP 2019 pin design continues our constellation theme. The 2019 pin features Cassiopeia. We also have SSSP Embroidered Patches available for $8. SSSP cannot refund the prepaid banquet costs within 48-hours of the banquet (ie. after 5:00 p.m. on the preceding Thursday) since the SSSP locks in their banquet costs to the Resort at that time. If shirts are pre-ordered, the SSSP may not be able to cancel shirt orders within 3 weeks of the star party. If possible, refunds for shirts will be made, but if cancellation is not possible, shirts will be mailed out at the withdrawing participant's cost after the star party. No shows are defined as those who have not registered by the end of registration period on the Saturday afternoon of the star party. However, banquet tickets are always in demand right up to the starting minute of the banquet! There is almost always a waiting list since banquet seating space is limited. If you have not made previous arrangements and find that at the last minute you cannot come to the star party or cannot attend the banquet, please telephone us at 306-280-1899 (star party cell) and let us know if you will release your banquet tickets for resale. If we can resell your banquet tickets, even within the 48-hour no-refund window, we will refund the entire cost to you. Someone at the star party will be delighted that you thought of them! Otherwise, your tickets will be held for you assuming you will show up at the last minute and are thus not otherwise refundable. * For refunds of $25 and less, SSSP will issue you a credit for a future SSSP and will inform you of this before the next year's registration. However, we will be glad to refund the $25 or less by cheque if you request this. The SSSP 2019 shirt design honours the 50th anniversary of the Apollo moon landing on July 20, 1969, 50 years, 1 month and 8 days before the start of SSSP. The powerful Saturn V rocket generated 7.5 million pounds of thrust, enough to lift the 36-story high rocket and Neil Armstrong, Buzz Aldrin and Michael Collins to the moon. The Apollo series of space flights inspired may of us to become astronomers and some of us to become scientists and engineers. Shirts have to be pre-ordered during the Early Registration period for them to be available to you at the star party. The on-site order prices will remain the same as pre-orders except that $10 extra will be charged for shipping where applicable. SSSP is held in Meadows Campground. Meadows has a Service Centre with flush toilets and showers. SSSP had input into the design of the Service Centre, so that the building remains as dark as possible and contains separate red lighting used during the star party. However, Meadows also contains streetlights that are used outside of star party dates. All streetlights follow dark-sky full cut-off requirements. It should be noted that the Cypress Hills Dark-Sky Preserve Agreement does not limit development within the Park, especially in the core area where businesses are located and where campers camp. Thus new and renovated campgrounds can receive lighting provided that it is compliant with dark-sky rules. Meadows covers approximately 8 acres of a 197,000-acre dark-sky preserve. Almost all other areas of the Park outside of the core area contain no lighting. In 2013, SaskPower changed the last 90 old style drop-lens cobra-head streetlights in the Park to IP-addressable flat-lens full cut-off lights that can be dimmed and turned off by the Park using an RF link. These lights can be dimmed or shut off on command. Almost all streetlights within the park are now compliant to the Dark-sky Agreement. If observing time is desired beyond star party dates, any area within the park can be used for that activity, though you cannot camp overnight in non-designated campgrounds. You can, however, take advantage of camping and no lights in the Dark-Sky campground immediately northwest of Meadows. The campground contains 16 non-powered, unlit campsites. Since the Cypress Observatory is the home of a new observatory and Yurt classroom, some activity using red light may occur during interpretive programs, but otherwise, the site is very dark. Eight outside power plugs and concrete pads for visitor telescopes are available for use and are located on the south side of the Observatory. Cypress DSP featured on Saskatchewan Televsion Network's "15 Minutes of Fame"
August 22 - Total Eclipse of the Sun - SSSP'44 is on the Centre Line! The Redlight Café will provide coffee tea, and hot chocolate in the Registration Tent in the Meadows on Thursday, Friday, and Saturday nights. Open about 10 pm – 1 am or so, maybe later. Refreshments by donation. You can register and/or order items on-line or by regular mail. If you have any questions, please contact the registrar at email sssp.sk@sasktel.net or call Rick at 306-665-3392. Transportation costs to and from the SSSP. Accommodation costs during your stay. Camping fees are paid to the Park, and Resort rooms are paid to the Resort. SSSP does not pay your camping fees; we just book the sites for you. Registration fees (payable the Saskatoon Centre of the RASC.) Registration fees pay for speakers, pre-paid meals and facilities rentals. Cash for commercial activities in the park (golfing, horseback riding, zip line, etc. ), though there are many free activities for the family. Cash for astronomical toys, since SSSP has astronomy vendors present. 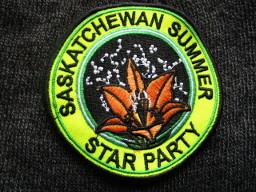 The on-line form can be used to Register and/or Order Items for the Saskatchewan Summer Star Party. Step 1: Fill out the form on the next page. If you are making additions to a previous registration/order, you can use the form again but please use the same email address. If you need to make changes to the form after it is submitted, please contact the registrar (include your registration/order number). Step 3: Check your email for your confirmation message and verify eveything looks correct to you. You should receive an email with your registration/order information and a second email confirming payment after your online payment has been processed. Step 4: Meet us at the registration tent to pick up your registration package and any items you ordered. May we contact you by email two or three times a year about next year's SSSP? Please list names of all attendees, as you would like them shown on the name tags. Include last names if different from Contact Person. What observing equipment do you expect to bring (binoculars, telescopes, etc.)? This will be printed in the SSSP handout. See the Resort/Camping section for instructions on how to book. Would you like to give a talk at the Friday night informal presentations (5-15 minutes)? Would you help at SSSP by volunteering for a 2-hour work shift? Check if special dietary requirements (e.g. Vegetarian, Vegan, lactose, gluten intolerance, etc.) Contact registrar with specifics. On-site availability of dinner banquet tickets not guaranteed if not requested and paid for in advance. On-site availability of shirts is not guaranteed if not requested and paid for by August 4, 2019. Shirt orders will be taken at the star party and mailed out afterwards. The on-site order prices will remain the same except that $10 or more will be charged for shipping where applicable. Golf shirts are not available in youth sizes. Your Registration / Order (SSSP2019 #) was accepted and a confirmation email has been sent to . Items were purchased, so please use the "Buy Now" button below to proceed to PayPal to pay your fees of . You will be able to pay on-line using either a PayPal account or by credit card. If you do not have a PayPal account and wish to pay by credit card, make sure to select the "Don't have a PayPal account?" link on the presented PayPal page. You do not need to create a PayPal account to pay by credit card. If you have any questions, or do not receive your confirmation email or payment confirmation, please email sssp.sk@sasktel.net or call Rick at 306-665-3392. Items were purchased, total fees of . You can send a cheque or payment to Richard Huziak, SSSP Registrar, 127 Maple Street, Saskatoon, SK, S7J 0A2, Canada, or pay at the star party. For payment inquires, contact SSSP at sssp.sk@sasktel.net or call Rick at 306-665-3392. Your registration/order information (SSSP2019 #) was accepted and a confirmation email has been sent to . No items were purchased, so no further actions should be required. If you have any questions, or do not receive your confirmation email, please email sssp.sk@sasktel.net or call Rick at 306-665-3392. The BBQ starts at 5 pm on Thursday and will be held by the Amphitheatre. Tickets are $7. The public talk will start after the BBQ, about 7 pm. The Kid's Program is being run by Jennifer Petriew with the assistance of Kim Kulak and Emily Petriew. Jennifer Petriew is married to Vance Petriew, discoverer of Comet Petriew. Not so coincidentally, her interest in astronomy began shortly after meeting said comet discoverer 20 years ago. Jennifer and Vance have three children, and she looks forward to spending time with the SSSP kids each year to help them have fun learning about astronomy. Emily Petriew is Jennifer's daughter. Kim Kulak is a wife and mother of a child with Autism and has a Bachelor of Education with a speciality in Early Childhood. She has worked over 20 years in a variety of settings educating and providing programs for young children including those with special needs. After a 3 year hiatus, Kim and family are attending their 9th SSSP and Kim is thrilled to be back volunteering with Jenn at the SSSP Kids Activities. SSSP Kids... join us on Saturday morning at the Yurt Observatory to play, create and explore the wonders of our universe with other SSSP kids! We will do some crafts, play and pretend, and maybe even learn a thing or two about astronomy! I'm looking forward to having some fun with you all!!! Parents are welcome to stay and help out the very young astronomers. This year we'll be learning about some interesting night sky objects, some ways that pictures are taken of these amazing objects and will get a chance to create a space craft to help us take pictures of spectacular things in space! (Okay, not a real space craft, but we can pretend!). There are a limited number of places for the banquet. They will be allocated on a "first registered, first allocated" basis. We strongly suggest that you preorder your tickets when you register. A small number of places will be held for at-the-door registrations but only if the room limit has not yet been exceeded. We also ask you, if you find that you are not able to come to the banquet but have preordered tickets, to contact us immediately by phoning 306-280-1899. We will refund your banquet ticket costs and will allocate your tickets to people on our waiting list. If you do not contact us beforehand and you do not show up, your banquet ticket costs will NOT be refunded. See "Refund Policy" for more information. I will be giving an update on the space MRI work that I talked about at the SSSP in 2013. We have come a long way since then and our first ankle-size MRI should be working by the time I give the 2019 SSSP talk. That ankle MRI will be tested in zero-g on a Falcon 20 jet in 2020. While building that MRI we have also been doing more design work for the Canadian Space Agency for a Space Station MRI. The Space Station MRI will be a "technology demonstration". It will be a step in taking MRIs to the Moon and beyond as part of Canada's formal plans to support lunar exploration for the next 24 years. We have been helping out with those exploration plans by defining what a "sick bay" would like on spacecraft that would spend up to three years in interplanetary space. We don't have funded work for Moon base MRI designs yet, but that would be the next step beyond the deep space transport sick bays. I'll give a brief look into what health care on a Moon base in the 2030's and 2040's might look like. Gordon graduated with a Mechanical Engineering degree from UNB in 1982 and went on to work for SED Systems in Saskatoon until 1989. At SED he designed thermal and mechanical systems for the WAMDII and WINDII instruments that were designed to look at the upper atmosphere from the Space Shuttle and the UARS satellite. He also worked on a Black Brant rocket payload to grow infrared detector material in microgravity. From 1989 to 1995 Gordon completed degrees in applied mathematics at USask and moved on to do post-doctoral work at the Royal University Hospital with MRI. In 2000 he joined the Psychology Department at USask to do functional MRI of the brain. Gordon is now department head there and is very busy working on the MRI technology that he will be talking about in his SSSP talk. There is a child in school today who will become the first astronaut to land and walk on the Red Planet. To inspire and prepare this Mars generation to the challenges of space exploration, I have been running a robotic Mars exploration simulation for the past 15 years. This simulation was modelled after the “Red Rover Goes to Mars program” created by Lego and the Planetary Society in 2004. The simulation involves setting up a Mars yard (simulated Mars surface) in a draped off area of the classroom using rock types that simulate the ones found on Mars by NASA rovers. With the help of the teacher, students are all assigned roles from planetary scientists, engineers, mission controllers, rover drivers, Mars yard workers and media. The class must work together and explore their landing site using only robotics that are manipulated remotely guided by televised images (just like real planetary scientists). The students identify rock types, produce a geology map of their landing site and collect environmental measurements. At the end of the day, the science data collected by the controllers and science team are presented at a mock press conference. In this 40 minute presentation, I will explain how this simulation started as a small demo activity and show how it has grown to the simulation used today. I will also describe how the simulation is setup in the classroom and describe the technology used to make this an educational and interactive experience for the students. If time permits, I will also touch on two other student activities that can be incorporated into the science curriculum. Don is an amateur astronomer and a life member of the Royal Astronomical Society of Canada (RASC). He was twice President of the Calgary chapter of the RASC and a strong supporter of public education activities. He has spent several decades sharing his passion for the night sky by visiting schools and offering teacher workshops. Don has been heard on the CBC morning show “the Calgary EyeOpener” with his monthly updates on astronomical events since 1984. Don is an active volunteer with several organizations and has asteroid 73704 named after him for his many years of community service. He is a co-award winner of the E.R. Neale Award for offering astronomy teacher workshops. You can follow Don on Twitter and Instagram with his handle - astrogeo. The American Association of Variable Star Observers launched a Citizen Sky project in 2009 to generate observations of Epsilon Aurigae. The basis for the project was the “10 Star Tutorial” which included 10 naked eye variable stars. The talk uses the “10 Star Tutorial” as a primer to introduce beginners to variable star observing while expanding the original “naked eye” list to include targets suitable for binoculars. Topics will include a presentation of a light curve, a presentation of a variable star chart, how to generate a star chart suitable for binoculars and how to estimate and record the magnitude of a variable star. Instructions on how to register and report the measurements to the AAVSO will also be included. The observing clinic will include the estimation of a naked eye variable and a the estimation of a binocular variable. We will work through several examples so that the group becomes comfortable with the process. The purpose of the clinic is to introduce beginners to variable star observing but more experienced observers are encouraged to come and help out. Equipment required: working eyes, pencil and paper, binoculars (if you have them). The charts for binoculars are also suitable for small refracting telescopes with correct image diagonals. Jim Goodridge has been an active visual observer for a number of years. Jim is currently Vice-President of RASC Saskatoon Centre has served in the past on the SSSP organizing committee and as President of RASC Saskatoon Ctr. While retaining an addiction to expensive eyepieces Jim has been exploring simplified observing using grab’n’go equipment and short observing sessions, focusing on about 300 objects that are mostly easily observed from the backyard.